This strange cute yellow thing is the Peugeot honey-B concept, and like it’s namesake looks pretty much like a big honey bee on wheels. It was developed to combined the feeling of being in a large SUV-like car but with the efficiency of an aerodynamic design, something tall and bulky SUVs are hardly capable of achieving. 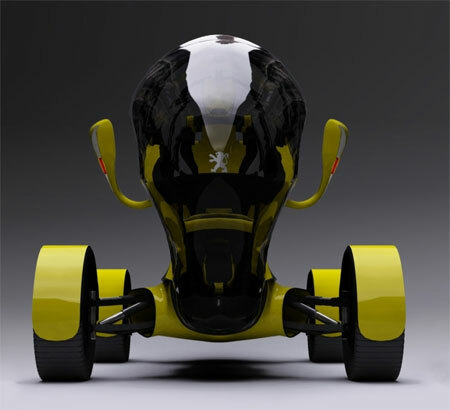 Like all futuristic concepts, the Peugeot honey-B concept is powered by hydrogen fuel cells and in-wheel motors. 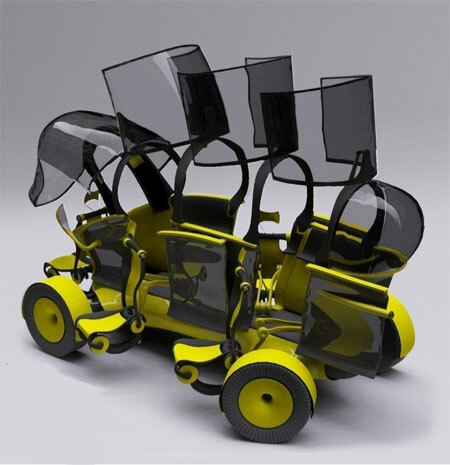 The honey-B is also disabled-friendly, with seats equipped with hydraulic arms that can deploy to various pre-set positions outside the car, and retract back in again automatically after you’ve sat in it. Designer’s description and more photos after the jump. 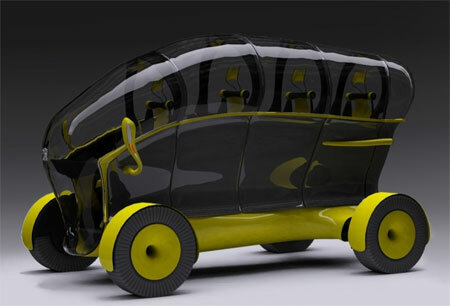 The concept started around the idea of somehow mixing together the efficiency of a aerodynamic car and the feeling of well being of a large car. Working with preliminary sketches,emerged the idea of placing the passengers in a line, much like the pilots in a jet fighter would sit. I was also encouraged to explore alternative design solutions looking at some of the concept cars Peugeot produced during the years. I particularly liked the Peugeot Hoggar and Peugeot Quark, the latter also for it’s propulsion system. 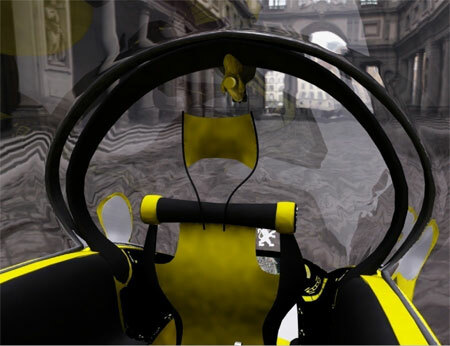 The name is a play of words: honey bee becomes honey-B, and refers to the car’s appearance and colors, trying to establish a easily recognizable identity. 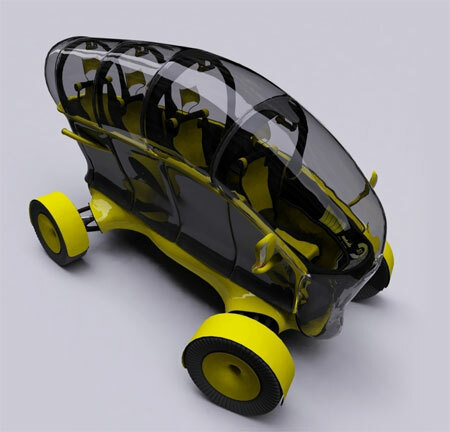 The car body is divided in two, with the lower body housing the hydrogen fuel cell reserve, the car structure and electronic components, and the upper body containing the passenger seats, structure and the envelope. 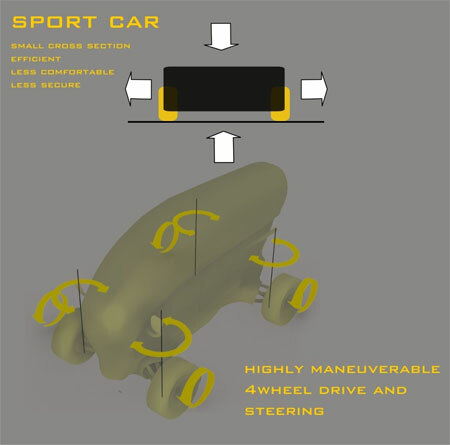 The four wheels are separated from the body, simplifying the internal structure. 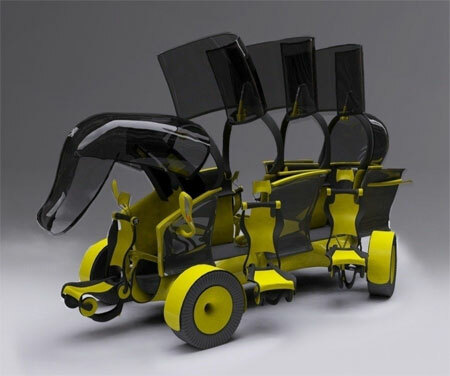 In the design, particular emphasis was placed on trying to capture some of Peugeot design features incorporated in it’s production and concept car models. While providing the same cross section as a highly aerodynamic sport car, which creates minimal drag while driving, Peugeot honey-B would give the same feeling of security and well being as a large SUV (sport utility vehicle). 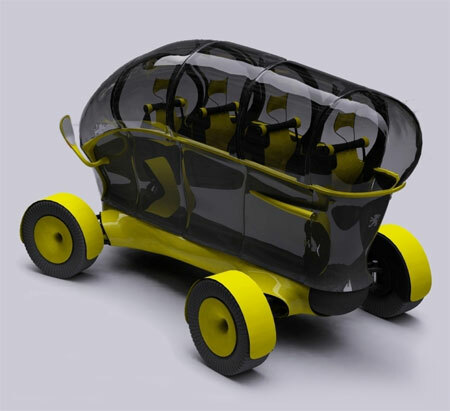 The passengers would sit in a line, providing each with full panoramic views, and a greater feeling of individuality. The roof and windows are combined in a single canopy, and passengers can enjoy the same thrill experienced during flight. Featuring four wheel drive and steering, Peugeot honey-B would enjoy excellent maneuverability and ride comfort in both city and off road conditions. 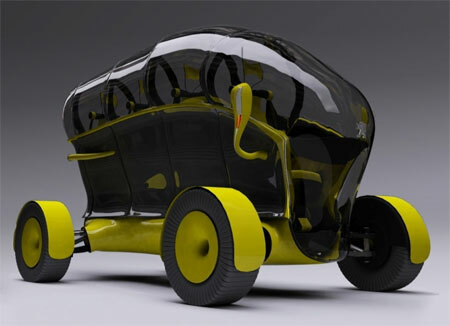 Powered by four small in-wheel electric engines and hydrogen fuel cells, much like the Peugeot Quark concept vehicle, Peugeot honey-B would provide an ecological alternative to today’s mainstream propulsion systems, while, at the same time, giving excellent performance and freeing up much interior space. 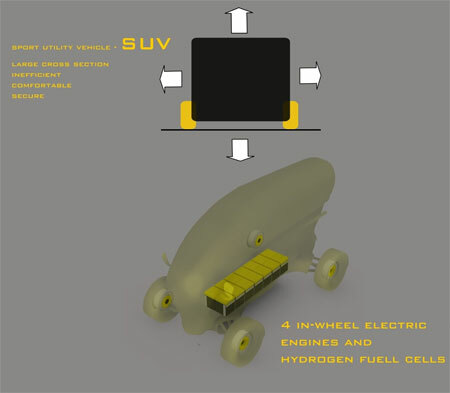 The hydrogen fuel cells are housed in the lower body, giving stability to the whole car, assuring a smooth, safe ride. The four small electric in-wheel engines offer multiple advantages, for instance there is no need for complex transmission gears, thus saving weight and internal space. They also allow for energy recuperation during breaking. To provide comfort and also to provide easy access for disabled people, Peugeot honey-b features retractable seating, powered by small, on board hydraulic systems. 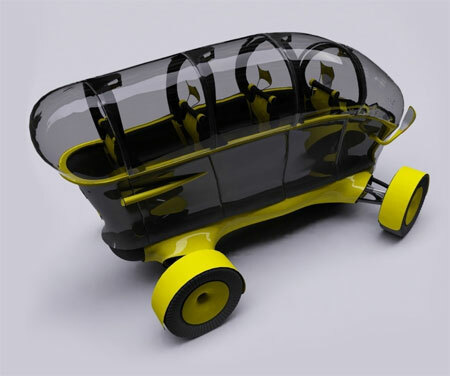 The systems assures that the car would be accessible for every person, of every age. 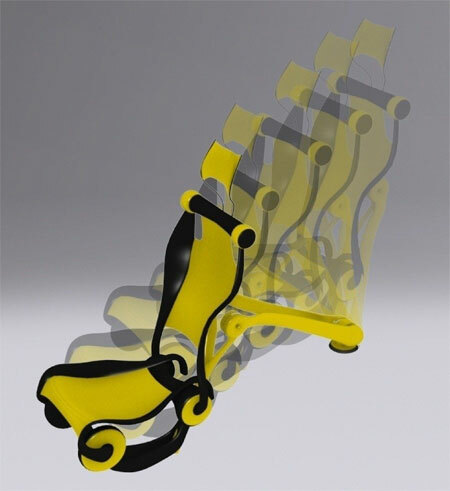 The system would work in the following order: first the canopy would lift up; then the computer driven retractable chair would deploy into preset positions around the vehicle, and then, in turns, the passengers would take their seats, which would automatically start to fold, and retract into the interior of the car. Computers would monitor at all time the procedure, adjusting the hydraulic pressure depending on the passenger’s weight and movements. The experience of driving would be made easier and more enjoyable by the use of computer- assisted driving, much like in today’s modern airplanes, where the pilot gives instructions to a computer, which in turn decides exactly what to do. For this reason, and also to free space, the steering wheel is replaced by a pair of touchpad areas, controlling at the same time acceleration and breaking, and left and wright steering. 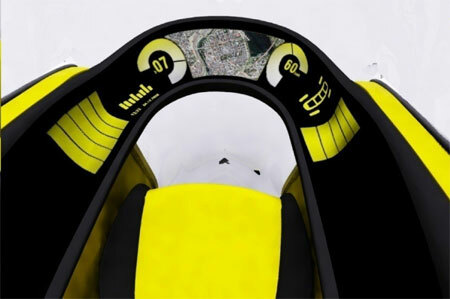 Also the control board would feature advanced, OLED displays, giving a flexible account of the vehicle’s status and whereabouts. The PEUGEOT honey-B also features a new system, which replaces traditional lightbulb headlights, and it’s based on new LED technology, much more flexible and durable. The headlights would practically conform to the shape of the mirror system, resulting in a much more integrated design. 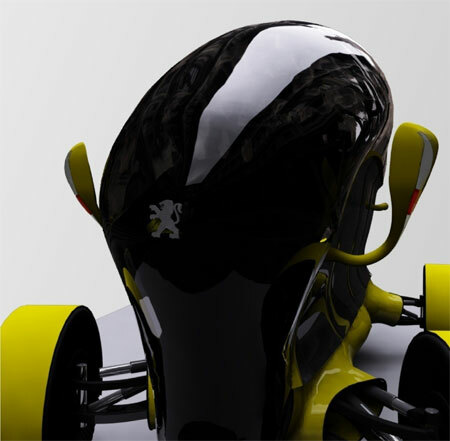 The PEUGEOT Design Competition has been a great challenge, but also a good opportunity to engage new ideas. The PEUGEOT honey-B helped me understand a little bit better both the limitations, but also the opportunities presented to today’s automotive industry.